Salvage teams are hoping to refloat a bulk carrier which has been stranded on the Australian seaboard for almost three weeks. 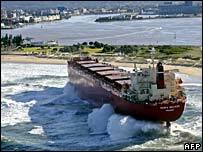 Three tugboats have started trying to winch the Japanese vessel Pasha Bulker past a reef, and deeper to sea. The vessel is carrying 700 tonnes of heavy fuel oil, and poses a major environmental threat to the New South Wales coastline. She ran aground during the worst storms to hit the region for 30 years. Her crew had ignored warnings to head further out to sea. With her bright red hull contrasted against the golden arc of Nobby's Beach, the 225m (738ft) bulk carrier has become something of a tourist attraction these past three weeks. But the Pasha Bulker has definitely outstayed her welcome. There is a fear that the ship could break up if buffeted by another heavy storm, spilling tonnes of heavy fuel oil and chemicals into the sea. Local surfers want to reclaim their beach, which has been shut since the Pasha Bulker went aground. On Thursday night, three powerful tugboats began trying to winch the 40,000-tonne vessel past a reef close to shore, using the night-time tides to help heave her seaward. But one of the cables connecting a tug to the stranded freighter snapped, forcing it to move out to sea. The operation has now ended for the night, but is due to continue on Friday and Saturday night. There is a danger that the hull could be damaged during the operation, and oil spill response teams are on hand in case there are problems.